U.K. Chart Detail : Did NOT chart ! Detail : Paul's fourteenth solo single. but this Paul McCartney official single release ... failed to chart ... a first for Paul. 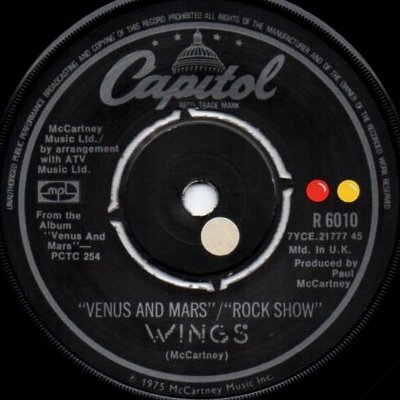 The medley on the A-side was an edit job, Venus and Mars lost several seconds, but Rock Show was abbreviated by over four minutes ! It was this edited mix that appeared later on "Wingspan" - it's first issue on C.D. At least the b-side was complete. The single was not released in a picture sleeve, and is on "Capitol".